Our view from our hotel room in Champex, Switzerland. A four-course dinner in a grand old dining room capped the day Thursday. 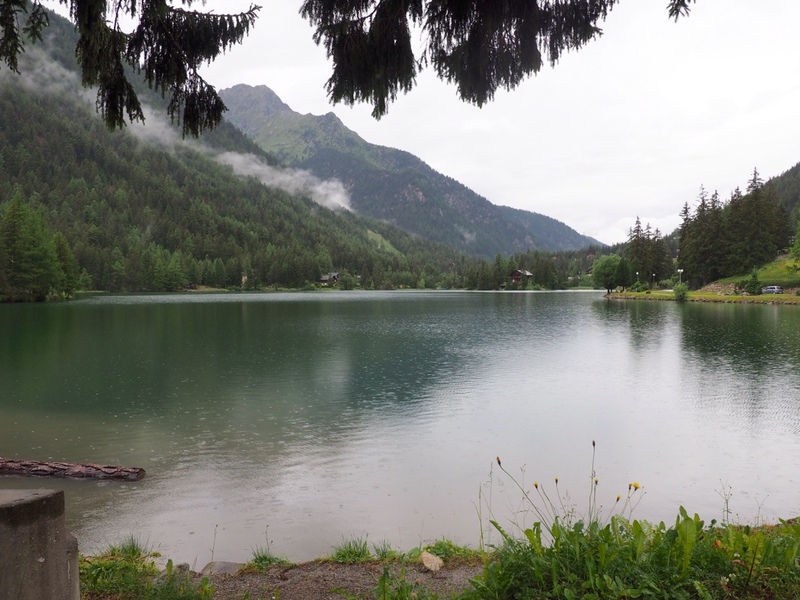 Lac Champex is just a few steps from our hotel. It offers several bars, cafes and stores. Winter skiing is its big draw. Our hotel in Champex has a commanding view in several directions. The blue skies of the past five days have gone and there has been a bit of rain, thunder and lightening today, a rest day in Champex, Switzerland. We met trekkers who had to turn back this morning from the next day's col due to lightening. 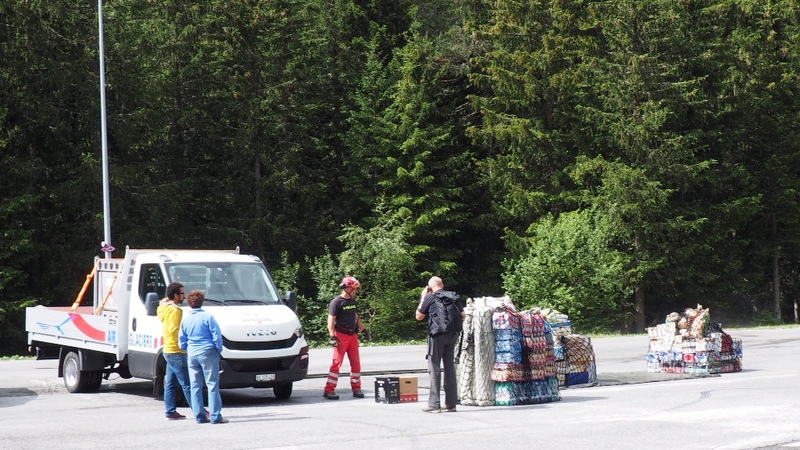 They faced a 200€ taxi to the next town around the mountains. Our trek Thursday to this 5,000-foot elevation lake town was advertised as the easiest day of the Tour. It was all downhill from La Fouly to about 3,400 feet. 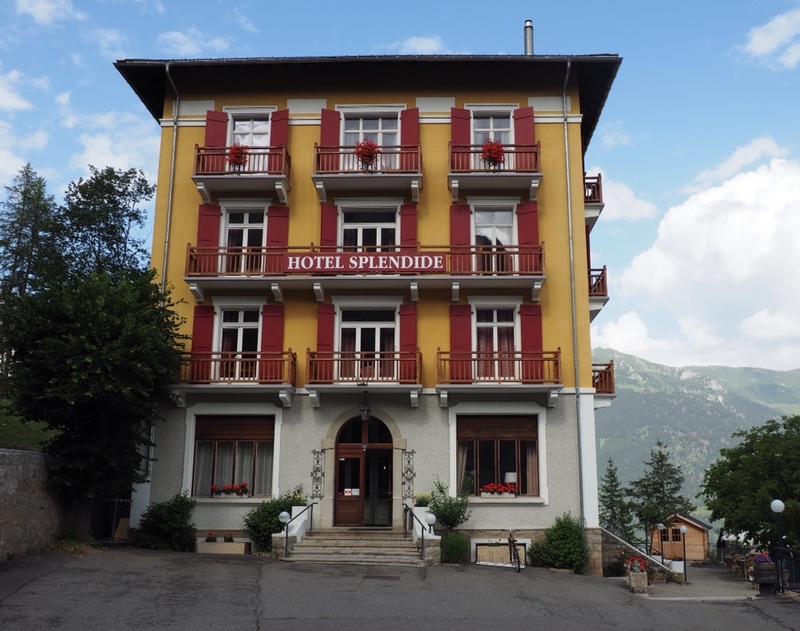 We passed through several tiny Swiss villages that were strangely almost deserted. So far, so good. The guidebook said there would be a bit of a climb to the lake. Well, 1,600 feet was much less than previous days, but the steep trail featured rocks, roots and steep drop offs. 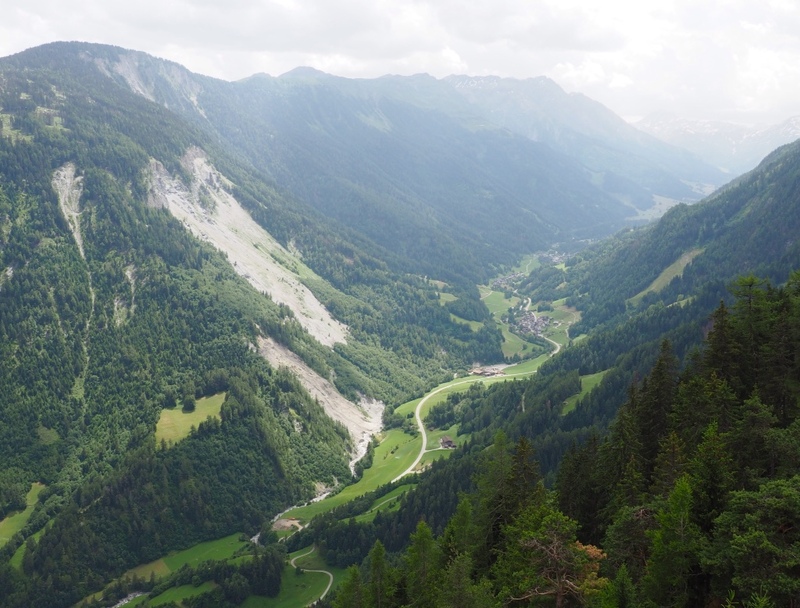 We have learned there is very little easy about the Tour du Mont Blanc, except how easy it is on the eyes. Switzerland is not part of the European Union, but there has been no passport control, even when we checked into our hotel. The Swiss franc is the official currency, but the euro is accepted here. The cashiers all carry huge wallets with both francs and euros. We have been using credit cards to get the best exchange rate. French is the main language in this part of the country, just as we had gotten used to our Italian greetings. Help us solve the mystery at the bottom of this post. Several pallets of supplies await a helicopter delivery to a remote Alpine refuge or hut. 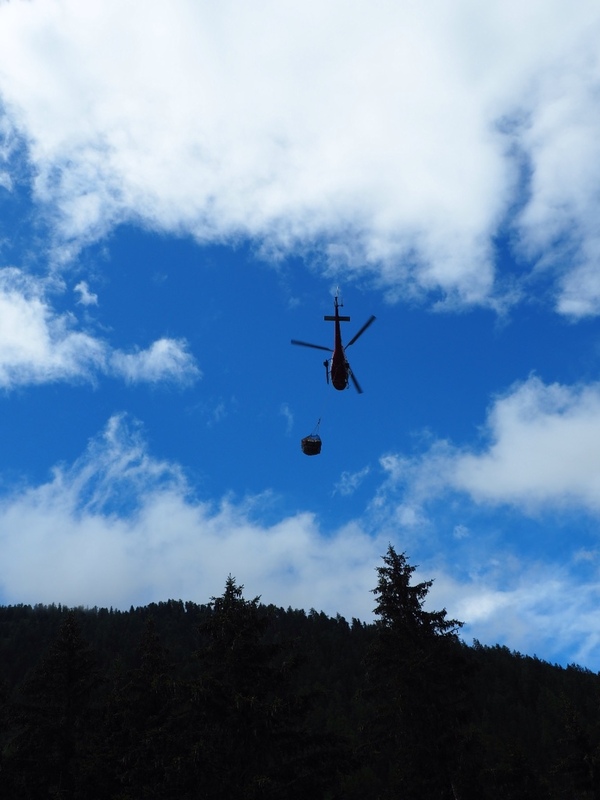 A helicopter picks up one of several loads in Champex. 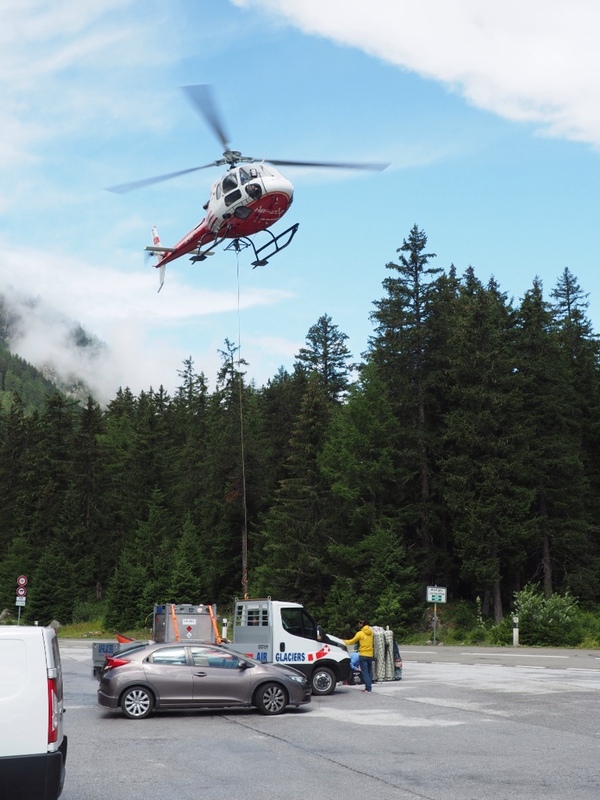 The helicopter is off, soon to return for the next load. 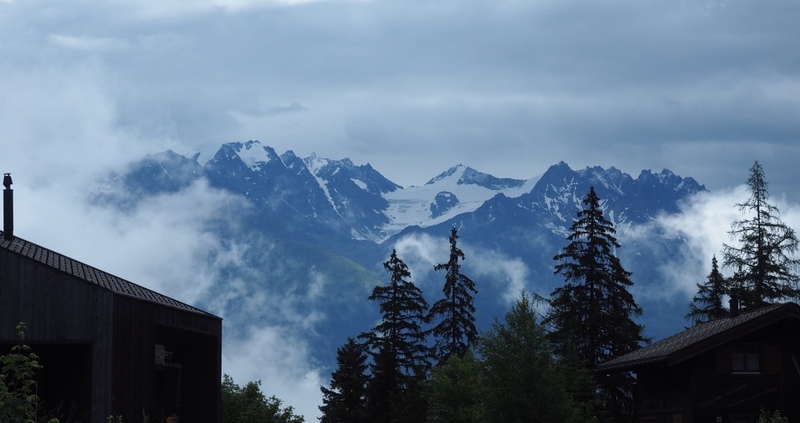 Today's cloudy view of the Alps from Champex. This contraption has eight arms and rotates, but we could not figure out what it was used for. What is this? 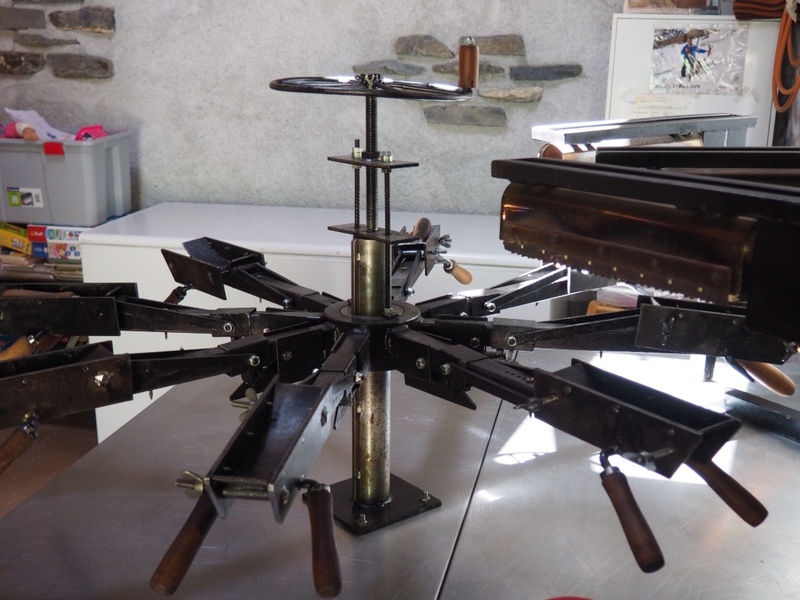 We saw this machine a few days ago in a remote Alpine refuge that looked like it had once been a horse facility. Do you know what it is? Let us know by clicking on “comment” at the bottom of this post. So the mystery surrounding the “contraption” continues. Always great to hear from you. Keep your fingers for us that the weather gods are kind tomorrow! We will await your next post to see if you were able to continue the trek or go to plan b. What an adventure this has been–even from here. Enjoy your day’s rest and your distance from the Republican Convention! Well, Pam, the weather broke and we were able to walk today! Steep up and down, as usual, but no buses, trains or taxis! Beer time at the alburgue. Cheers! Thanks, Pam. We met a couple from Chicago today who had worked hard to prep for the Tour. On their first day, she fell and broke her arm. They have veen driving and trying to get to as many of their accommodations as they can. They plan to return in two years. Your cruise is around the bend!